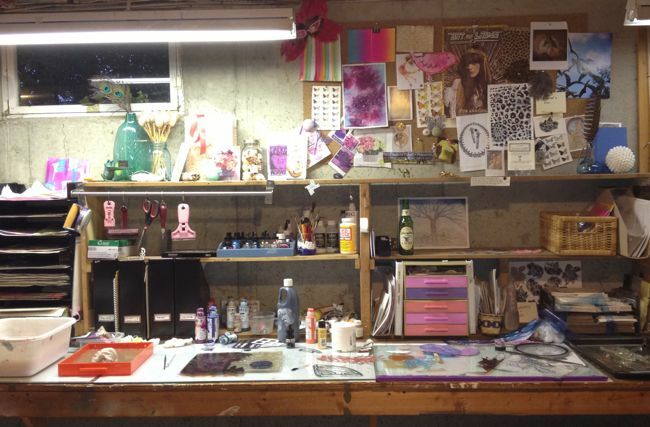 I thought I’d share with you photos of where I do my messy artwork these days…in my glamorous basement! This workbench was built by the previous owners. 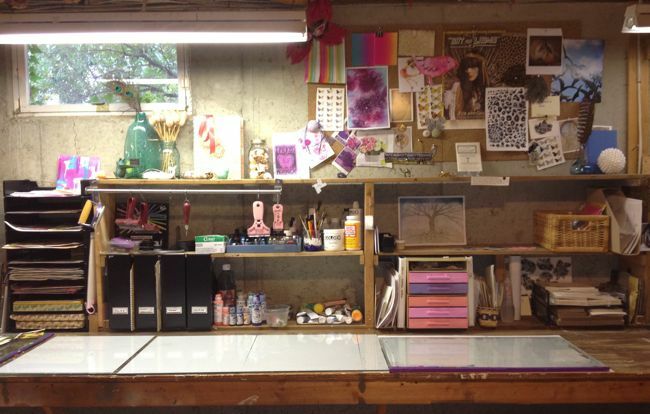 I used to have a ‘real’ ‘neat’ ‘organized’ studio in the old house, but I was petrified to spill anything on the rug which really stifled my work. I also felt like I had to cleanup when guests came over. Now I’m happy to throw paint around, leave a mess and let the kids play with me! I hope to paint the wood and maybe hang some funky fabric by the window. I couldn’t be happier except running water and a window view would be nice (dear universe). I did have a chipmunk peek in at me through the little window one day. I recently got into gelatin printmaking and am having fun experimenting with that below. I hope to have some nice results in time for a holiday show! You can see I have lots of inspiration tacked on the upper walls & shelves to remind me of where I’m going…. What you don’t see…Pandora radio set to iamwhoami or austra radio…canvas & easel behind me…kids running. Thanks for stopping by! Keep an eye on my Society6 shop for gelatin prints for your home & tech accessories. Free shipping thru Oct 13 with this link. Yeah! That’s what I like to see! Thanks for my new water source Mom & Pop! Awesome place and will keep my eyes peeled. Gel prints are up now! thanks for stopping Lisa! Glad you have a space you can create in and enjoy.